Lenni started the business in 2010 as a sprout stall 'The Happy Sprout' at the Noosa Farmer's Market. 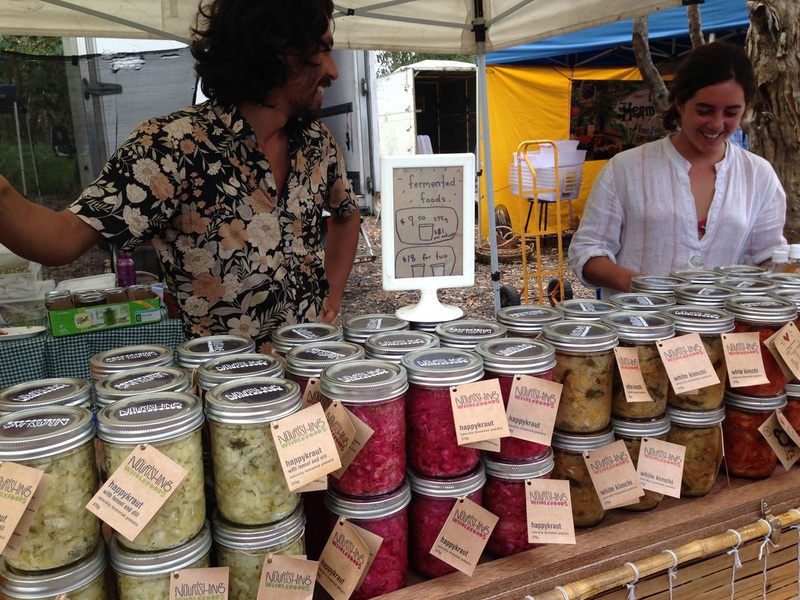 Shaw came along a few years later, bringing a passion for fermentation and slow food. Together we created Nourishing Wholefoods, adding lacto-fermented sauerkraut, kimchi, kombucha and bone broth to the product range. Among the chaos of business evolution, two little people joined the tribe and an amazing crew of friends and family have stepped up to keep it all flowing. Lenni's dad Maarten and step-mum Jackie generously offer a lot of their time, skills and wisdom - from building the commercial kitchen to labelling thousands of bottles and jars. Jeremy is the master of production and Macgyver of the business, fixing our trucks and second hand equipment, designing and implementing systems and building custom machines. Without him we would still be bottling kombucha with a jug! He manages the bulk of the work in the kitchen including cabbage chopping and pounding which is seriously physical work! Lisa and Vanessa are all round legends paying close attention to detail and keep everything running smoothly in the kitchen. Pia and Heromani do deliveries to local shops and rock the markets every weekend. Ian and Kristian are skilled and happy builders who have created an amazing space to work in that keeps getting better and more efficient all the time. We're also grateful to be surrounded by our wonderful and supportive friends Ian, Erin and Marcel who live on our property and allow us to maintain a balance of work, family and community life by helping out and hanging out when needed. Finally, a big thank you to all our wwoofers, helpers, travelling friends and family who have been such an significant part of our journey and enriched our lives with skills, wisdom and hard yakka! Our vision and philosophy is to limit our business to a scale that allows us to stay connected to our local community here on the Sunshine Coast and balance our time with family and friends. We feel so lucky to be part of this wonderful community and to have the privilege to do what we love and feel appreciated for doing it!